We sat down with #ThePitch Judge, Piraye Beim, to discuss her new campaign #SayTheFWord. She shared some advice for female entrepreneurs and the inspiration for her company, Celmatix. 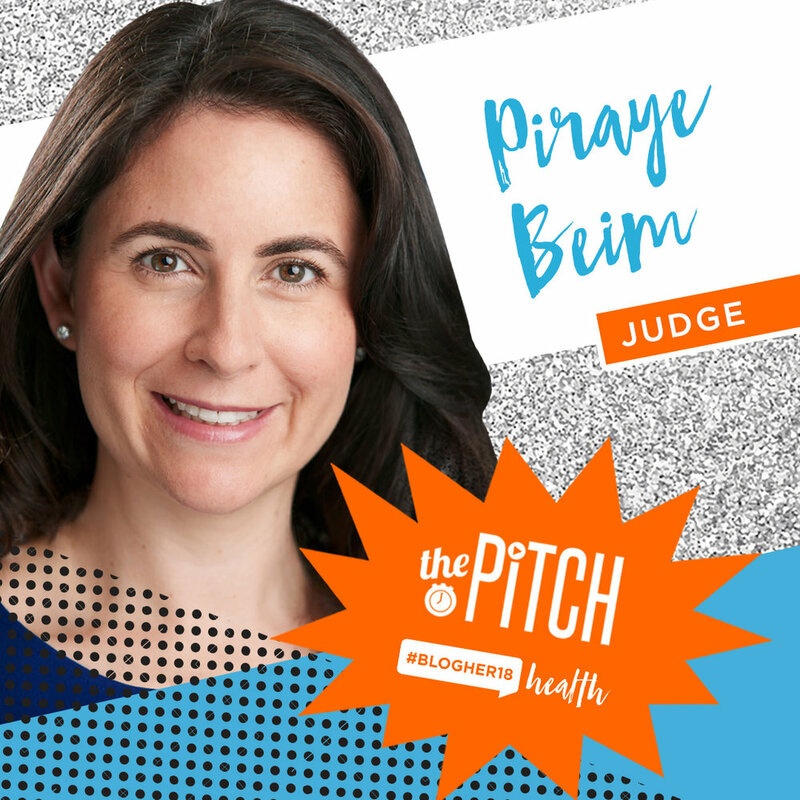 We are so excited for you to be a judge for #ThePitch at #BlogHer18 Health. What advice would you give to up-and-coming female entrepreneurs who are seeking to make a difference in the health space? PB: It was once said that everything Fred Astaire did on the dance floor, Ginger Rogers did but backwards and in high heels. In many ways, my experience has proven this to be true of entrepreneurship as well: Women face a greater challenge than men breaking into the business world as entrepreneurs. So my advice is that you have to be your own best advocate, stay the course, and believe the people who believe in you. When I started out, I didn’t have any business expertise or experience. I was trained as a molecular geneticist in academia. Everyone told me that I needed to have a “guy with white hair” in meetings with me to be taken seriously, and I believed that for several years. Then I realized that having an older male in the room was like Dumbo’s feather. I realized I could fly on my own, and it was my passion and vision as an entrepreneur that ultimately people were investing in. That inner strength and confidence is the starting place, but then you need to build a great team around you too. Even the best start-ups are a roller coaster. You need a great team to keep you grounded and focused during the highs and to lift you up during the lows. Finally, for women who are looking to impact the health space, I would really urge you to find a scientific or clinical co-founder who has high personal integrity. Sadly, I see too many companies funded by well-intentioned non-experts who end up doing more harm than good. Healthcare has gotten a reputation from investors of being ultra-high risk, but I think that backing good science with the potential for a huge impact is actually very low risk. The returns of companies with solid scientific footing end up getting vastly diluted by the ones without, so it gives people an impression that healthcare is a riskier proposition than it actually is. As a health entrepreneur, you founded the company, Celmatix. Tell us about your company and its mission. PB: Celmatix is a next-generation women’s health company, and our mission is to change the existing approach to women’s health and reproductive care, which until now has been very reactive rather than proactive. We want to empower women and their physicians with better information so they can make important reproductive health decisions at the beginning of their journey with a personalized plan, rather than taking the current “one size fits most” approach that fails with so many women. The first human genome sequence was announced in 2001, the year I started graduate school. We were officially in the “post-genomic” era and, for the first time, it became possible to start leveraging genetic information to guide clinical decision making, understand disease risk, and develop more precise drugs with far fewer side effects. I was lucky to be on one of the early “precision medicine” projects in the cancer world in the first years of my PhD. Later, when I was doing my postdoctoral research at Cambridge University in the UK, I learned that this paradigm of personalized and precision medicine was not being applied to women’s health. In retrospect, I shouldn’t have been so stunned because women’s health is such an underfunded area of research. The same year, I turned 30, which is a big milestone for many women. I had started thinking for the first time about my own fertility and many of my married friends were already struggling to conceive. That was my “aha!” moment. I wanted to leverage this powerful new tool, the genome, to do for women’s health what was being done for cancer. So I left Cambridge, moved back to New York City, and launched Celmatix with my former graduate school roommate Laura Towart. The company was literally started in her living room in Tribeca. Today, we’re a 100+ employee company with two products: the Polaris® big data analytics platform, which has been used to counsel over 80,000 infertility patients in the US, and the Fertilome® test, a simple test that for the first time allows women to know if they were born with genetic risk factors for reproductive conditions like early menopause. You just launched a new campaign, #SayTheFWord this week. What inspired this campaign? PB: Millennials are the largest generation of current and future mothers in the history of humanity, and as the first generation of digital natives they have very different attitudes about health and what kinds of products meet their needs. We have been doing a lot of research to better understand their attitudes about reproductive health. It really bummed us out to learn that despite all of the progress that has been make in de-stigmatizing centuries-old taboos around gender identity and sexual preference, there’s still so much about fertility and the path to motherhood that’s off-limits. We believe that nothing about a women’s body or health should be taboo. It's time for women to feel comfortable talking openly about their health, starting with their reproductive health. Therefore, Celmatix, along with our allies, launched the #SaytheFword campaign this month to inspire women to make 2018 the year we break fertility taboos. We’re facilitating conversations about fertility by encouraging women to take a pledge to #SaytheFword. This campaign challenges the status quo that keeps women silent because we believe strongly in the power of open dialogue. Women have been kept silent and isolated in their decisions and experiences around reproductive health for far too long: One-fifth of women who have miscarriages do not tell their partners. Three-quarters of women who are interested in fertility treatments or who have undergone fertility treatments have not spoken to their friends about it, and more than a quarter of women who are interested in freezing their eggs or those who have frozen their eggs haven't talked about it with anyone. At Celmatix, we want to #SaytheFword and make 2018 the year that we bring reproductive health out of the closet and start engaging in open discussion about unique fertility differences and journeys. I started by sharing the story of my own miscarriage, which was something that I didn’t feel very comfortable talking openly about at the time. No one should have to go through an experience like that without the support of their employer and community. What are your goals for #SayTheFWord? PB: The campaign aims to encourage more open dialog about fertility by encouraging women to take a pledge to #SaytheFword to their friends, family, doctors, and at work. To facilitate this dialogue, we’ve created a dedicated site, www.wesaythefword.com, where women can “Pledge to #SaytheFword” and share their reproductive health goals, which could range from asking their family members and partners about their reproductive history, to having a conversation about fertility with their doctor or seeking fertility support from a specialist. For every pledge to #SaytheFword, Celmatix is donating $1 to organizations supporting women’s health, up to $25,000, including Planned Parenthood, RESOLVE: the National Infertility Association, The Women’s March, and the Endometriosis Foundation of America. In addition to taking the pledge, visitors to the site can explore information on reproductive health from medical professionals, discussion guides, links to informative blogs and podcasts, inspiring stories from other women, giveaways, and additional resources for women’s health. How do you hope to change the dialogue around fertility? PB: The stigma around reproductive health and fertility encourages guilt and shame, but the more we talk about fertility, the more we empower women to drop the guilt, move past the fear, and, ultimately, take more control. By pledging to #SaytheFword to your family, you start a conversation that could reveal important medical history—and that’s information you can use to better plan for the future you want. Saying it to your friends makes it clear that the topic is not off-limits, and ultimately sets up a support system that could benefits everyone. Saying it to your doctor means opening the door to learning more about your body, which could help you make more-informed decisions about your future or better understand your present. And saying it at work creates a more even playing field for women. If we say it enough, we believe that the days of stigmatizing any aspect of a woman’s body will be over. What is your advice to those women struggling with trying to conceive? PB: Try to remember: It’s not your fault, it’s your biology. I personally did not have an easy fertility journey. In my case, thanks to the genetic test that I helped developed at Celmatix, I now know that I was born with alterations in two keys genes in my DNA that make it harder to conceive and sustain a pregnancy. The same biology that makes me uniquely me also made me more prone to having difficulties on the path to building my family. Knowing this about my body has helped me heal from the difficulty I experienced, and I believe this level of knowledge could help other women as well. With new technology comes new opportunities to understand, optimize, and extend female fertility potential, and I believe that technology can help illuminate the fact that no one should feel shame or guilt about who they are, reproductively, or otherwise.